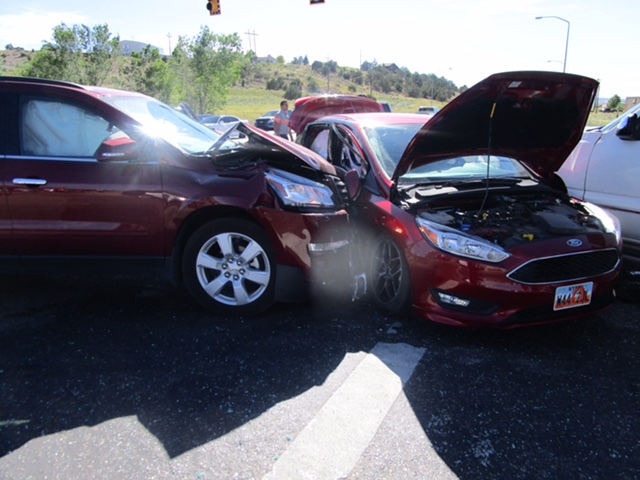 CEDAR CITY – An 11-year-old male passenger was transported to the hospital Wednesday evening following a three-vehicle crash allegedly caused by one driver running a red light, authorities said. Cedar City Police responded at around 5:15 p.m. to a crash on the intersection of 200 North and College Way. Fire crews were also initially dispatched to the scene because witnesses reported people trapped inside the vehicles. The boy was transported by Gold Cross Ambulance to Cedar City Hospital. It appeared his injuries were not life threatening, Womack said. The crash was allegedly caused when a red Chevy Traverse SUV was traveling west on 200 North and ran a red light, “T-boning” a small red Ford compact car that was heading north on College Way. The collision of the two vehicles sent the Ford car crashing into a white Chevy Suburban that had been waiting at the light to turn left onto 200 North. No other injuries were reported from the crash. Another distracted driving incident? People don’t have a right to drive, they have a responsibility, and law makers have a responsibility to pass laws to ensure only responsible people are behind the wheel.